A Mop Fair at Little Moreton Hall will provide a glimpse of Tudor life at grass-roots level. Mop Fairs were annual events where farmers and other employers hired their workers and servants for the coming year. Men and women turned up with the tools of their trade. People without any specialised skills usually carried a mop, or mop head, indicating they were available for hire as labourers and cleaners or for general fetching and carrying duties. Rebecca Alexander, from Little Moreton Hall said, “It was an important time for everyone. Employers wanted to secure workers who were healthy and reliable. Workers needed a job to guarantee shelter and food for the coming year. For them, it was literally a matter of life and death. “For our event, the historical re-enactment group Amicorum will be demonstrating a whole range of skills which would be on offer at a Mop Fair. You will be able to see tailoring, willow-weaving, scribing, candle-making, and brick making. If you feel a bit below-par a ‘wise woman’ will be on hand to prescribe a remedy. You may see a bit of Tudor laundry work, baking and butter-making and there will be some Tudor camp-fire cooking. “At most Mop Fairs the recruiting sergeant would also wait around to sign up any likely lads who were getting a bit tired of the pastoral life. So we will also have archers, musketeers and artillerymen firing a mediaeval cannon. The gun may look a bit primitive now but in the early 16th Century it was the ultimate deterrent. “You may like to join one of our very popular guided tours of this wonderful old hall, follow the sixteenth ‘scent-ury’ trail of Tudor smells, or explore ‘The Other Side’ of the hall- upstairs rooms in the east wing which were only opened to visitors for the first time a few months ago. 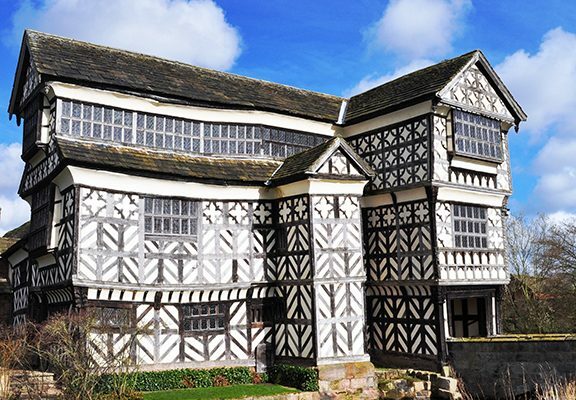 Little Moreton Hall is open Weds – Sun, 11am – 5pm. For more information visit www.nationaltrust.org.uk/littlemoretonhall or call 01260 272018.